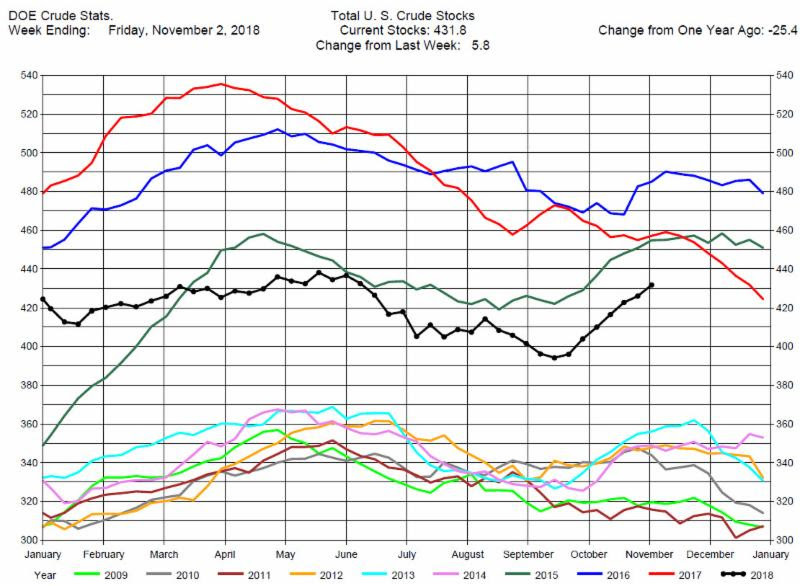 The DOE reported Total Crude Oil Inventories increased by 5.8 million barrels to 431.8 million barrels for the week ending November 2, 2018, while expectations average was for a 2.3 million barrel increase. Overall hydrocarbon supplies increased by 4.8 million barrels to 1,253 million barrels. 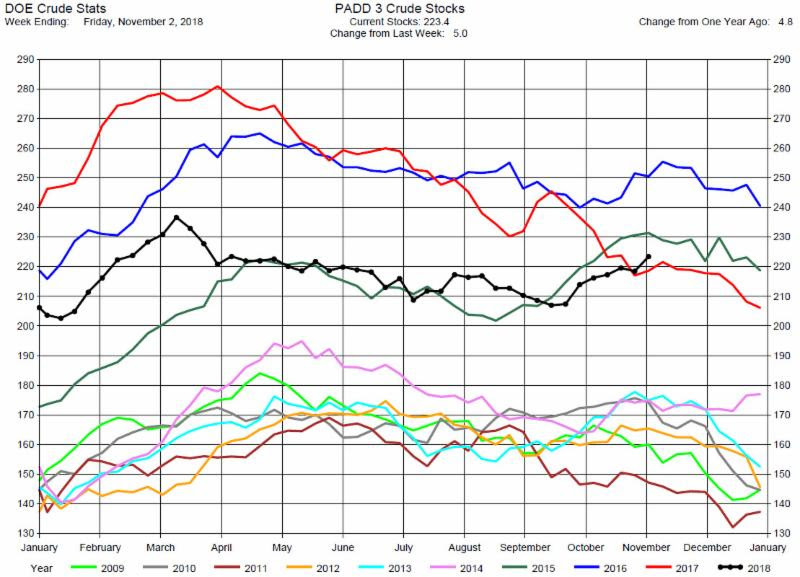 Crude Oil Production increased by 400,000 barrels per day to a new record 11.6 million barrels per day. Total Crude Imports were up by 200,000 barrels per day to 7.5 million barrels per day. 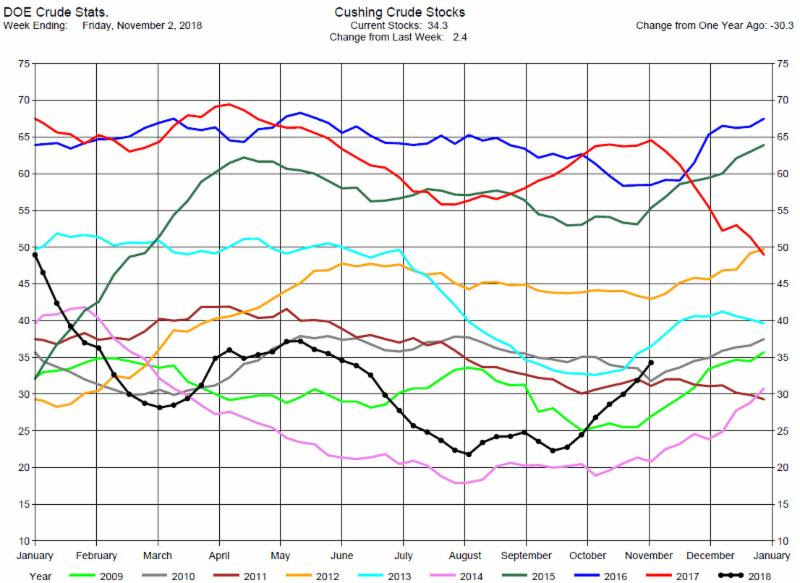 Total Refinery Crude Runs were unchanged at 16.41 million barrels per day. This DOE report was bearish for crude oil prices and the market dropped, nearly a dollar at one point, and ending down around 50 cents for the day. The sanctions on Iranian crude oil were set to begin this week. However, temporary waivers have been granted to some of Iran’s biggest oil clients — China, India, South Korea, Japan, Italy, Greece, Taiwan, and Turkey — allowing them to import oil. 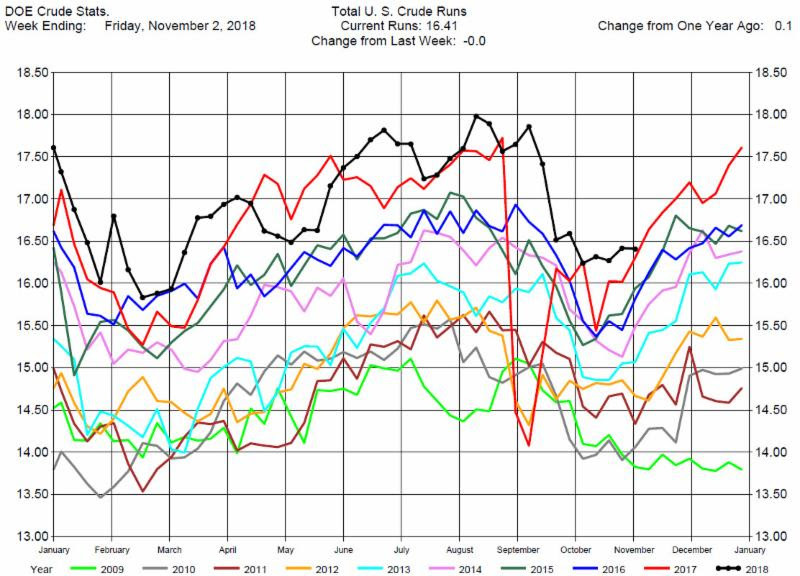 Without the loss of Iranian crude and with the increased supply from OPEC and Russia, the world may be over-supplied and is reflected in the over $16 drop in crude prices since mid-October. This may change as the Saudi’s are now considering cutting output because of forecasts of lower global demand. We are still concerned with the increased volatility in the market so we recommend to be on the sidelines. 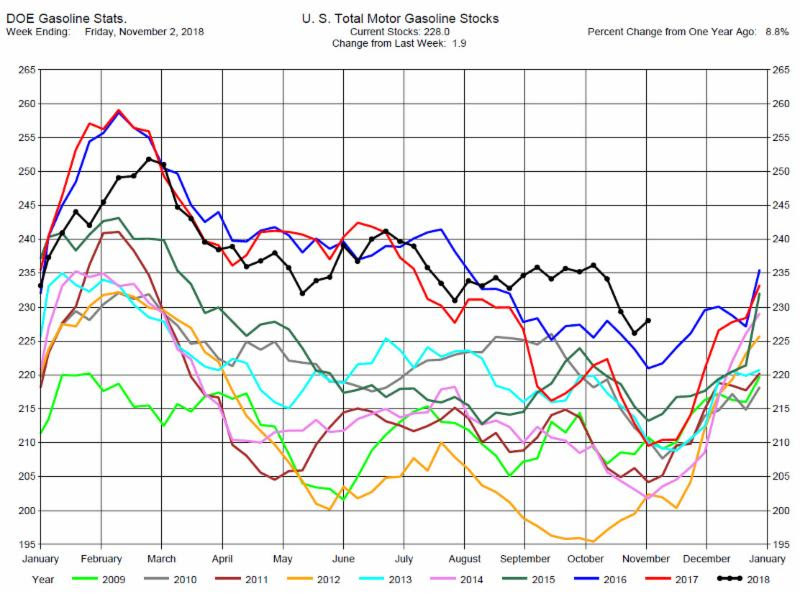 Gasoline Stocks Build. Expectations were for a draw. 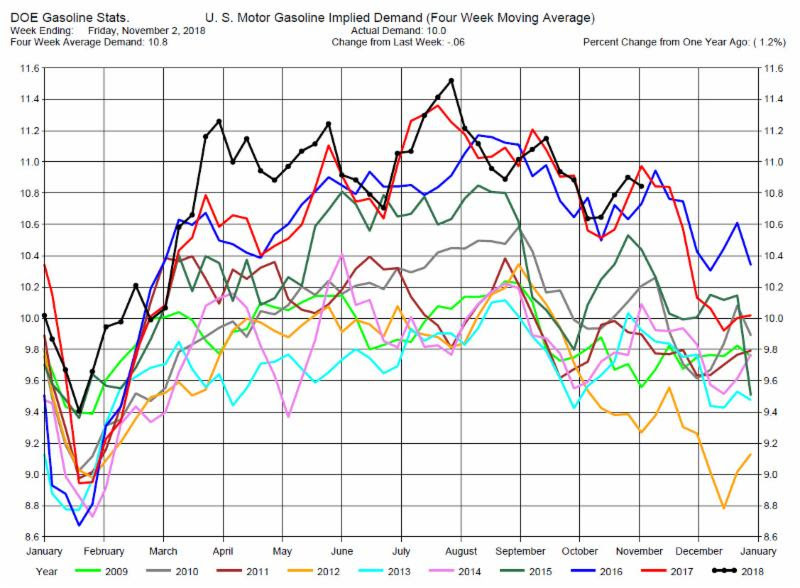 Total MotorGasoline Inventories increased by 1.9 million barrels to 228.0 million barrels for the week ending November 2, 2018, while expectations average was for a 2.4 million barrel decrease. Implied Demand was down by 60,000 barrels per day to 10.0 million barrels per day. 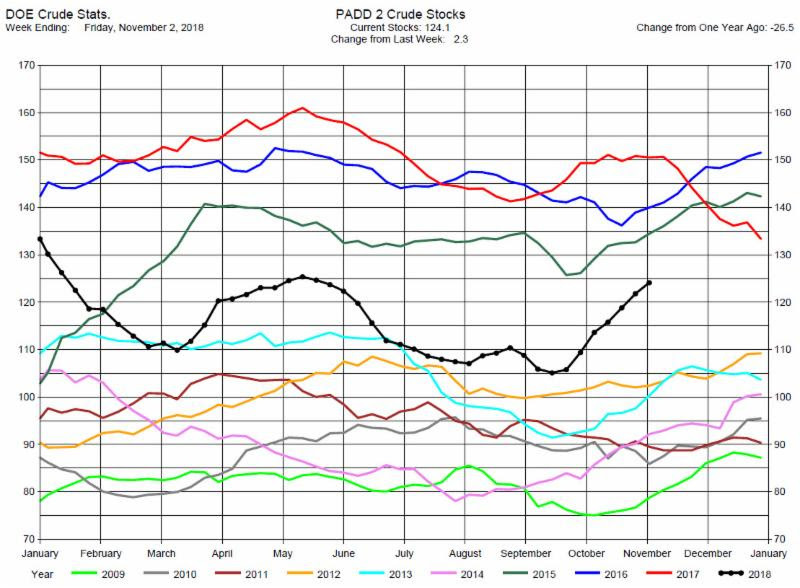 Gasoline Production was down by 650,000 barrels per day to 9.1 million barrels per day. 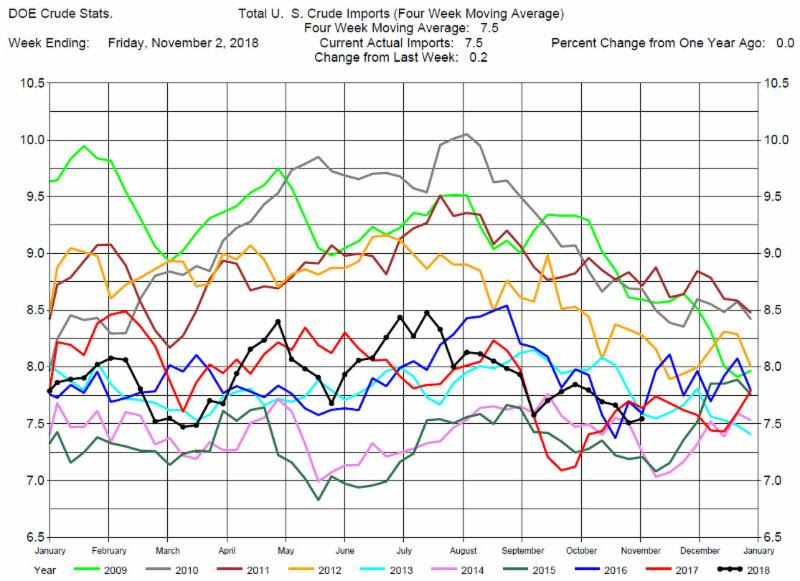 With the unanticipated build in gasoline inventories gasoline prices dropped in tandem with crude prices and ended the day down by more than $2 a barrel. 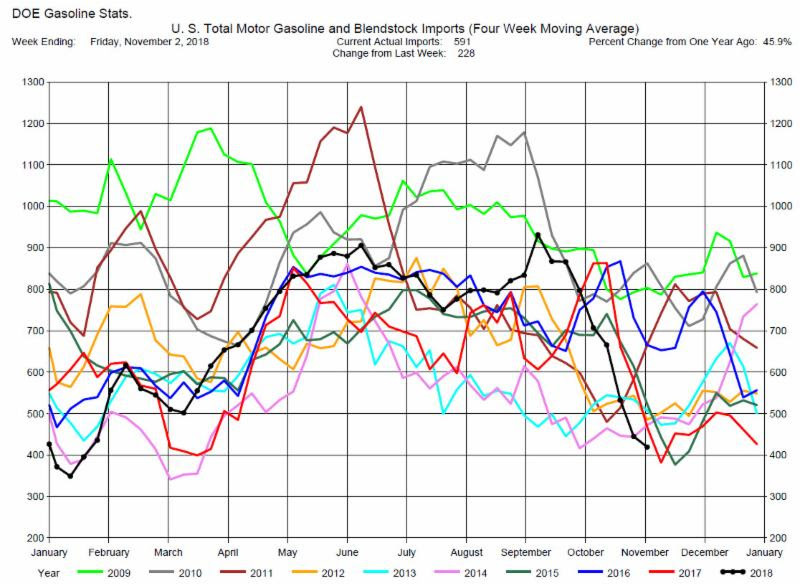 Gasoline prices are decreasing faster than crude oil prices. 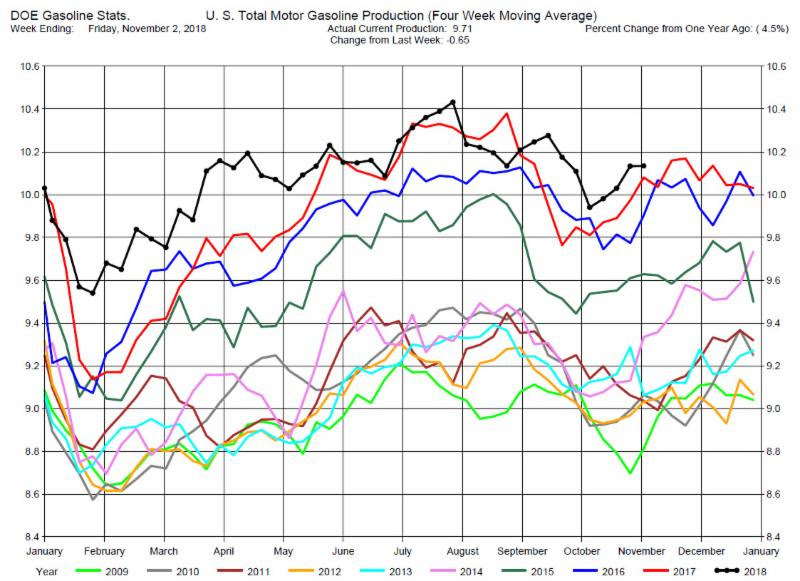 The gasoline margins (crack spreads) continue to weaken. Market sentiment remains bearish to prices so we recommend consideration of short positions, especially in the cracks. 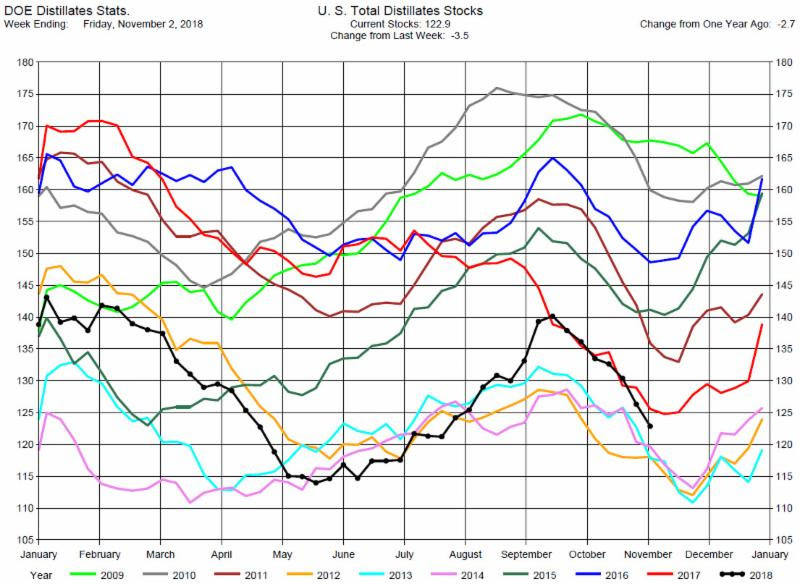 Distillates Stocks Draw, Greater than Expectations. 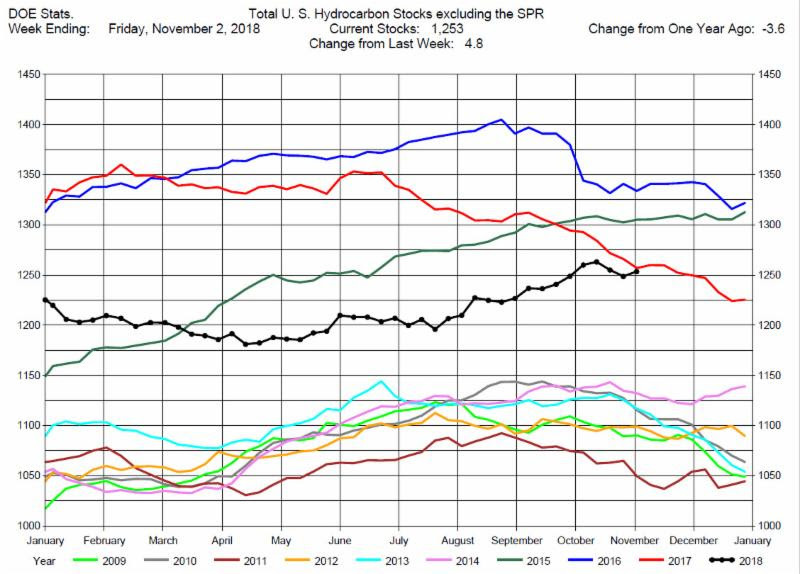 Total Distillates Stocks decreased by 3.5 million barrels to 122.9 million barrels for the week ending November 7, 2018, while expectations average was for a 2.0 million barrel draw. 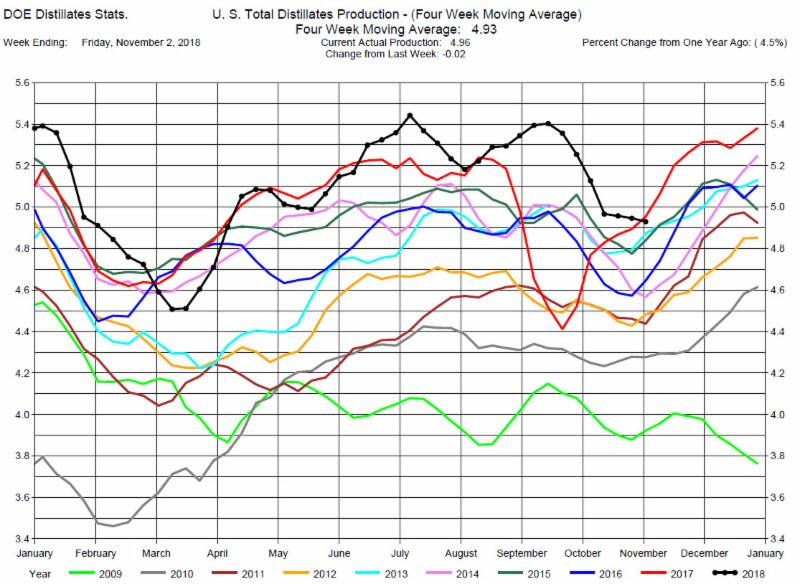 Total Distillates Production was down 20,000 barrels per day to 4.96 million barrels per day. 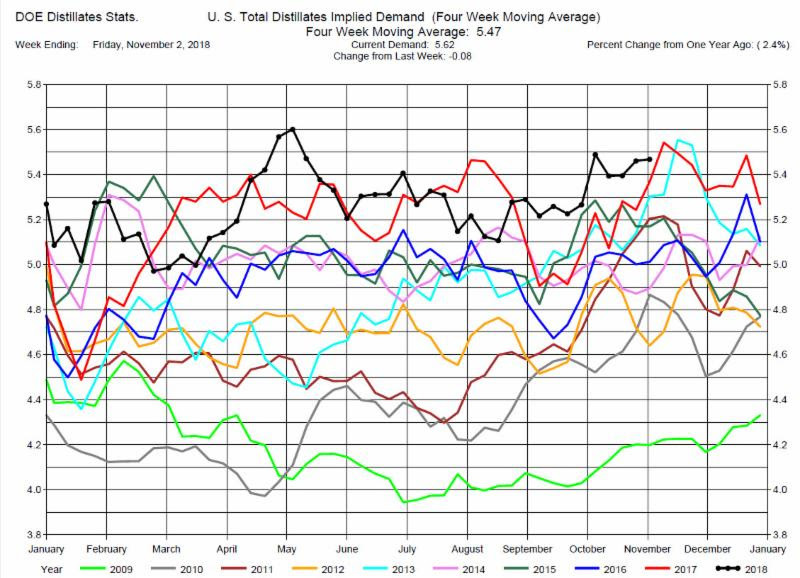 Total Distillates Implied Demand was down 80,00 barrels per day at 5.62 million barrels per day. 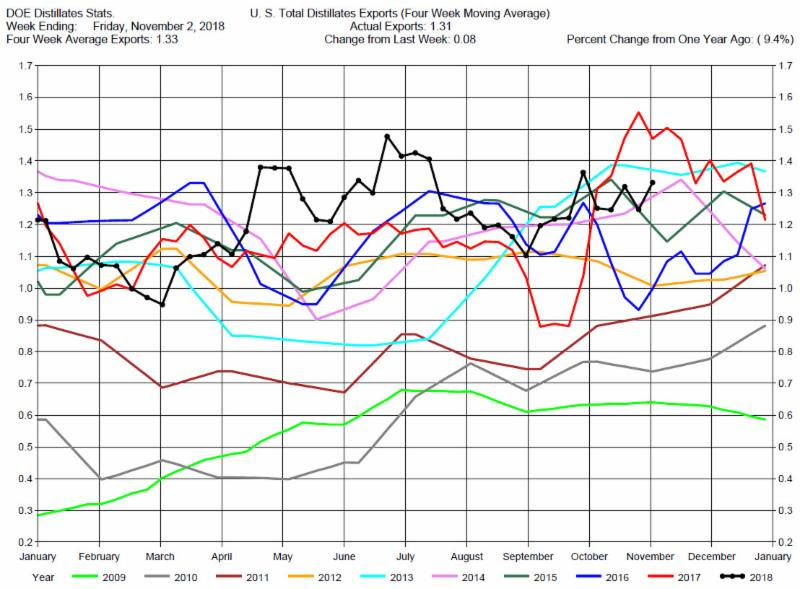 Heating Oil prices initially decreased after the DOE data release. However, since the stocks draw was greater than expected, prices rebounded and ended the day up nearly $2 a barrel. The heating oil price margin increased by over $2.50 a barrel. We maintain our suggestion of consideration of long positions in the Heating Oil Cracks.